MacArthur Fellowship. Avignon. Pittsburgh. The New York Public Library for the Performing Arts Exhibition. Copenhagen. Samuel H. Scripps American Dance Festival Award. Record Releases. Performances in Paris, BAM's Next Wave Festival, and On and On. On the June morning that Meredith Monk woke up to discover herself the recipient of a $315,000 MacArthur Fellowship, little did she anticipate what more the coming 12 months had in store for her. 1996 continues to be one of major achievement for Monk, one which reflects the prismatic range of her remarkable gifts as a composer, director, choreographer, vocalist, and film-maker. Beginning with the MacArthur Fellowship (a.k.a. Genius Award), Monk was then selected recipient of the 1996 Samuel H. Scripps American Dance Festival Award. The $25,000 award is annually given to choreographers for their life-time contribution to American modern dance. And that’s just for starters. 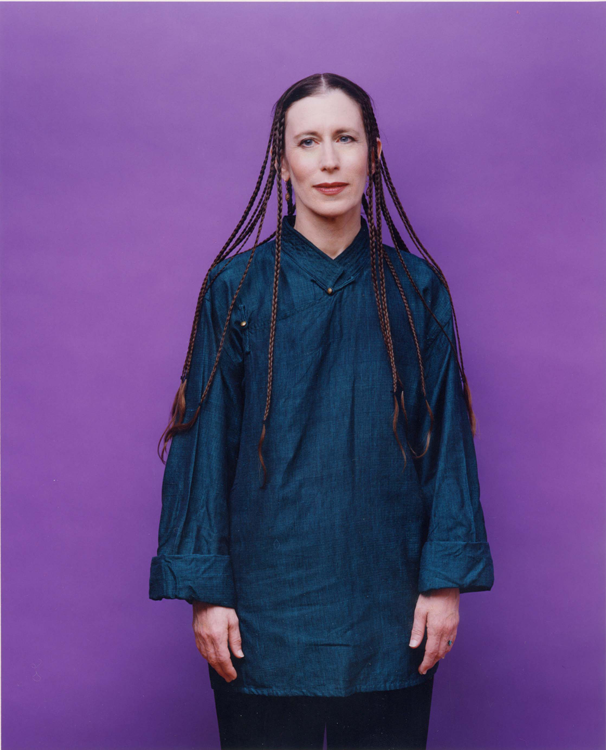 “ARCHEOLOGY OF AN ARTIST”: The Vincent Astor Gallery at The New York Public Library for the Performing Arts was the scene of a multi-media retrospective entitled “Meredith Monk: Archeology Of An Artist,” May 21 through September 14. Incorporating the art forms that Monk has criss-crossed and integrated over her 32 years as an artist, the exhibition — actually more of an environment — was overseen by Monk herself. Replete with artifacts from the more than 100 works that Monk has created over the years, the show functioned as a kind of travelogue through the artist’s boundless visual and aural imagination. The carefully designed landscape of props, shoes, masks, costumes, hats, airplanes, boats, and cars were amplified with musical selections from Monk’s prize-winning recordings and showings of the silent films she has created. “THE POLITICS OF QUIET”: The New York premiere of Monk’s most recent musical theater work, “The Politics of Quiet”, takes place as part of Broolyn Academy of Music’s Next Wave Festival, October 10-13. Meditative in mood, ritualistic in structure, and featuring a cast of 10 singers/dancers/actors and two instrumentalists, the new work integrates and fuses music, movement, light, sound and scientific objects to explore the integrating and healing potential of the performing arts in a rapidly fragmenting society. Countering the din of faxes, the dizzying speed of computer technology with its meditative spirit, “The Politics of Quiet” received its world premiere at Copenhagen 96 in Denmark on July 17 through 21, followed by performances at the 1996 Avignon Festival in France. Its American premiere took place at the Lied Center for Performing Arts in Lincoln, NE, September 27. MUSIC, MUSIC IN THE AIR & EVERYWHERE, OUTDOORS AND IN: Two albums of Monk’s music are scheduled for release in 1996. The first is “Monk and the Abbess,” a recording of selections from “Quarry,” “Book of Days,” “The Games,” “Chacon,” and the new composition “Nightfall.” Performed by Musica Sacra, the recording, which also includes music by the 12th century spiritual leader Hildegard of Bingen, was recently released on the Catalyst/BMG label. Scheduled for winter release is the ECM recording of “Volcano Songs,” featuring duets and solos from the 1994 show of the same name, as well as “New York Requiem,” among others. A European tour of “Volcano Songs” is scheduled for October and November. This summer Monk also created a non-sectarian service as part of the 100th anniversary celebration of American Guild of Organists at the Union Theological Seminary, July 8-11. The service included Monk’s choral music and choreography which was performed by her ensemble. As a fourth generation singer in her family, Monk’s early musical training included piano and Dalcroze Eurhythmic studies. At Sarah Lawrence College from which she graduated in 1964, she studied composition, music, theater, dance, and film. Recognized by over two dozen honors for the hundred works she has created, Monk holds an honorary Doctor of Arts degree from Bard College and University of the Arts. Other awards include two Guggenheim Fellowships, three Obies for theater (including one for Sustained Creative Achievement), two Villager Awards, a “Bessie” (New York Dance and Performance Award for Sustained Achievement), the 1986 National Music Theater Award, sixteen ASCAP Awards for Musical Composition, a CINE Golden Eagle Award for film, the Rockefeller Fellowship for Distinguished Choreography, as well as the 1992 Dance Magazine Award. Meredith Monk recently completed her first Challenge Grant from the National Endowment for the Arts to continue to create large-scale interdisciplinary works. Meredith Monk’s most recent productions include “American Archeology #1,” a large-scale site specific work performed on Roosevelt Island in September 1994, and “Volcano Songs,” a solo work that integrates science and magic, presenting the artist as contemporary urban shaman that premiered in December 1994. The Politics of Quiet was co-commissioned by The House Foundation for the Arts, Inc., Leid Center for the Performing Arts, Walker Art Center, and Pittsburgh Dance Council. The Commissioning of The Politics of Quiet was made possible with funding from: Mary Flagler Cary Charitable Trust; Meet The Composer/Reader's Digest Commissioning Program, in partnership with the National Endowment for the Arts and the Lila Wallace-Reader's Digest Fund; The National Endowment for the Arts; and the New York State Council on the Arts. AT&T Foundation provided major corporate sponsorship. Additional support was provided by The Aaron Copland Fund for Music, The Harkness Foundations for Dance, Heathcote Art Foundation, The Rockefeller Foundation, and The Andy Warhol Foundation for the Visual Arts.